Want a better life with your dog? MySetterSam.com's Living Well With Your Dog, a series of short stories for pet owners, is loaded with common-sense ideas to help make life more fun, enjoyable and healthy for you and your dog. Find great tips about subjects such as: creating a comfortable lifestyle for you and your dog; making your home and environment safe; improving your pet's health and nutrition; choosing a pet sitter and veterinarian; and saving money on dog food, pet products, prescription drugs and pet insurance. Is natural food really natural? What's the secret to weight control? Can a vet make a difference? MySetterSam's four-part series provides answers about health and nutrition. Want a better life with your pet? MySetterSam's six-part series offers tips about getting your dog to relax at home, vacationing, choosing a pet sitter, coping with summer's heat and dealing with winter's cold. Want to save a bundle on pet food, products, prescription drugs? Should you buy pet insurance? MySetterSam's five-part series is loaded with tips to save you a bundle of cash. Tips for Living Well with Your Dog is a feature that appears on MySetterSam.com, a blog written by Joseph A. Reppucci, a retired editor from The Patriot Ledger in Quincy, Massachusetts. Mr. Reppucci worked as a reporter and editor on major daily newspapers in the Boston area for more than 30 years. 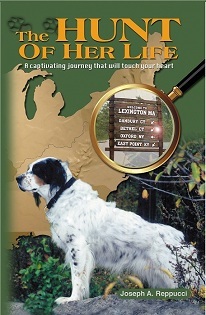 He is the author of the book, The Hunt of Her Life, a heartwarming story about his once-in-a-lifetime rescue dog. Find it on Amazon.com.